To take care of your water heater repair needs, call GAS ON Plumbing & Heating. We can provide a quick solution to fix your water heater. If you have had a bad experience with dishonest or outrageously expensive plumbers before, put your trust in GAS ON Plumbing & Heating to get the job done right. One of the problems with water heater and plumbing emergencies is that they do not wait for a convenient time to ruin your busy day. Being able to provide you with water heater repair at a moment’s notice is what makes us stand out from the competition. Adding our prompt response time to our honest attitude and affordable prices makes GAS ON Plumbing & Heating your number one choice. We can inspect your water heater and give you the best advice, and what your options are. 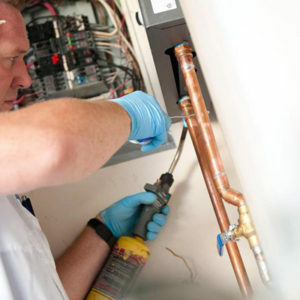 We may be able to provide a quick repair, but also advise you to replace your water heater for a more efficient system. However, it is recommended you replace your water heater every 7 to 10 years.